Webbed Feet, Web Log » Blog Archive » Ang Choulean: How Was Cambodia Born? Ang Choulean: How Was Cambodia Born? 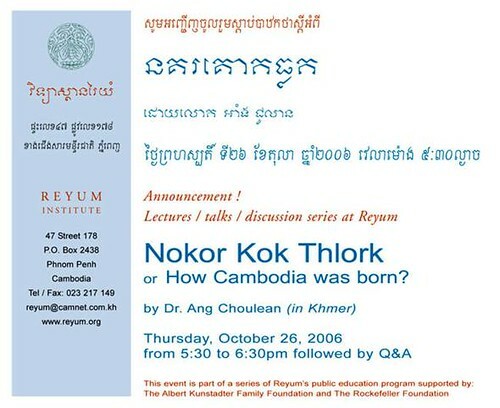 A Lecture/ Discussion (in Khmer) by Dr. Ang Choulean at Reyum Institute on Thursday, October 26 2006 at 5:30pm..
Nokor Kok Thlork or – How was Cambodia born? This event is part of a series of Reyum’s public education program supported by : The Albert Kunstadter Family Foundation and The Rockefeller Foundation. If interested, please contact Reyum Institute #47, Street 178 Phnom Penh, Cambodia.